No rambling from me today, let’s jump right in. Pictured is two coats of Milani Beach Front, which is shockingly opaque for such a light color. It borders on being a one-coater. This is a light sky blue packed with silver microglitter. The glitter is so fine that it isn’t hard to remove, if memory serves me. Next I have a manicure that went with my costume for the New York Renaissance Faire, which is always a blast. I started off with Revlon Teak Rose, a dusty, rosy red, which I adore. You might be able to get this in one coat, but I used two. I don’t buy entire nail polish collections. I don’t. 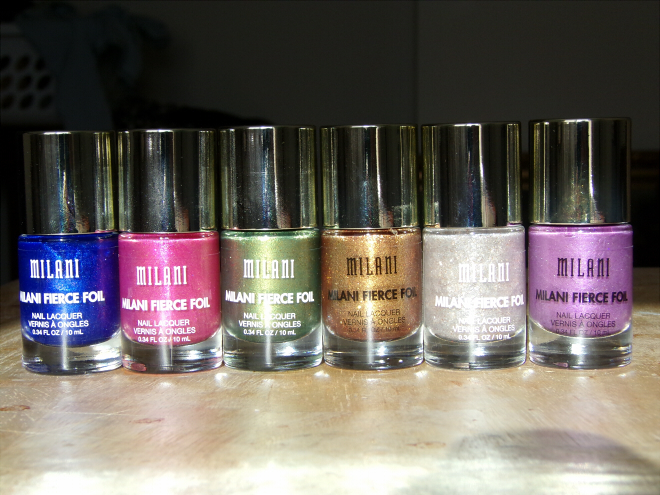 But Milani released a line of gorgeous colors based on famous Italian cities and I had to. I had to. From left to right we have Venice, Capri, Florence, Milan, Sardinia, and Rome. Each color in the collection contains flakes of real gold! Pretty cool. All of these are swatched below without topcoat. Topcoat would have added extra shine, but I wanted the gold flakes within the polish to be as visible as possible. 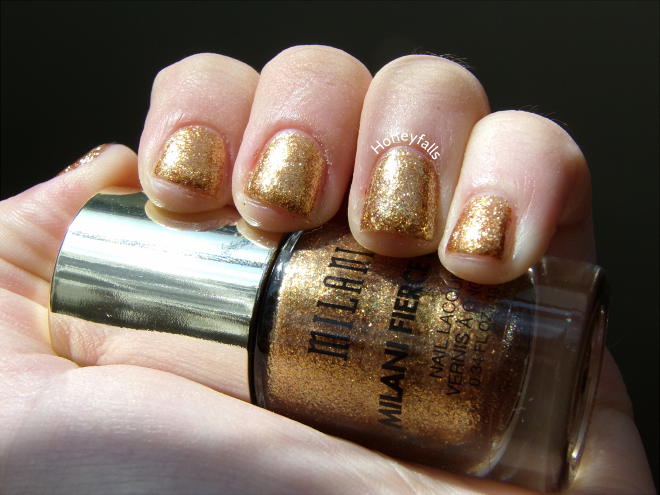 First in the collection is Milani Fierce Foil Milan “24-Karat Dazzle Drops.” It’s a stunning, densely packed gold flake polish that you can layer to opacity with ease. This is just two thick coats, and it totally eliminated any VNL! It’d probably be too thick to use for layering, actually. Second is Milani Fierce Foil Rome “Brushed Orchid,” a shimmery lavender with gold flakes. I love this one because orchids were very important to ancient Romans; it’s awesome that Milani did their research! Two coats of Rome provided full coverage. 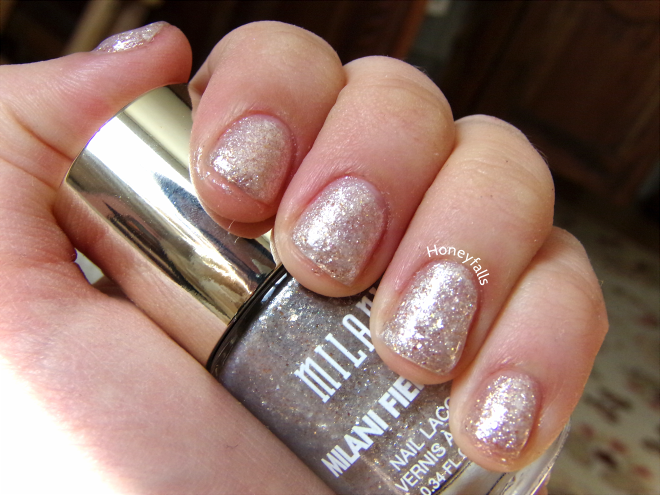 Milani Fierce Foil Florence “Sage Meets Seafoam” is the third in the series. It’s light olive, sage-y green that’s full of shimmer. This was two coats. The gold flakes mixed with this particular shade of green make me think of guacamole, haha. 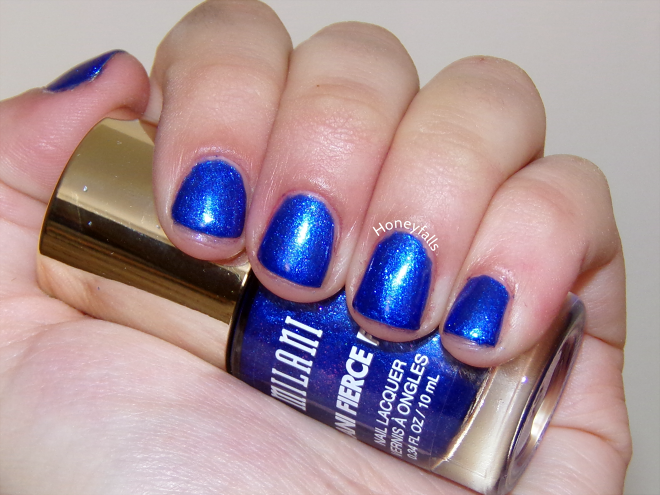 Next we have Milani Fierce Foil Venice “Sheer Sapphire.” I believe Milani chose this color for Venice because it’s supposed to resemble Venetian glass? That was the impression I got! 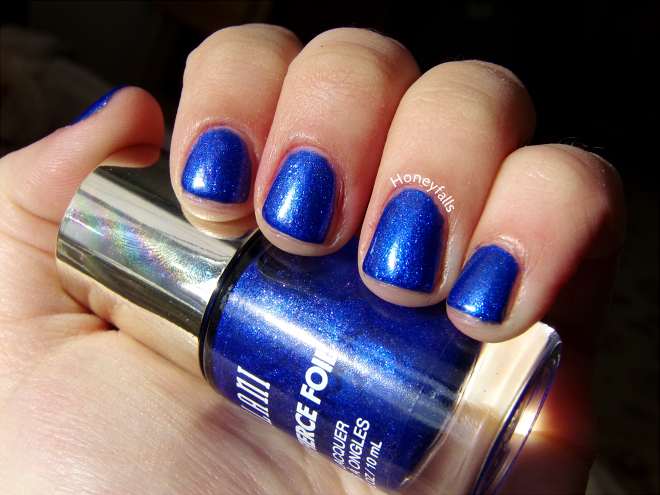 Venice has a subtle pink shimmer mixed in with its bright cobalt blue. Unlike the rest of the collection, it doesn’t have any gold flakes in it. I’m wearing two coats here. 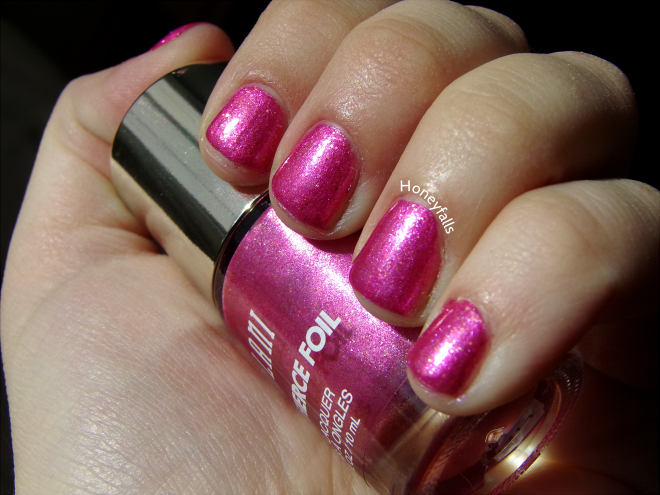 Fifth in the collection is Milani Fierce Foil Capri “Punchy Petal Pink.” It’s a juicy pink with gold flecks. Two coats was all I needed for total coverage. I don’t wear pink, but I like this one a lot; it’s almost neon, and is pretty unique within the collection. And last we have Milani Fierce Foil Sardinia “Shimmery-Whitecap Ivory.” You could layer this to opacity. You could. But don’t. Don’t try it. These photos show something like four coats. Sardinia is meant for layering! I knew that but I tried to get it opaque on its own and I was a fool. It’s beautiful though, so I’ll forgive it; it’s full of snowy-looking white flakes mixed with the collection’s signature gold flecks. I imagine it would look best over a dusty gray or a white. This collection has amazing colors and I adore the inspiration behind it, they all applied super easily and look fantastic.